I don’t know about you, but after I clean up around the house for the hundredth time each day, I start asking myself, “What’s the point? 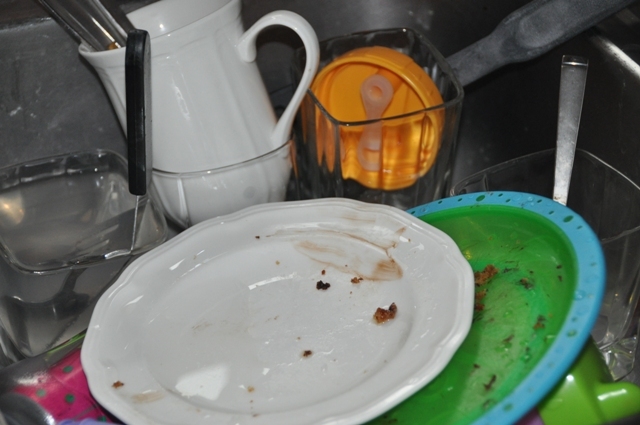 !” I begin to wOnDer if keeping up with the laundry and vacuuming up kiddo crumbs makes any difference at all. I mean, does it? They are just going to make a mess again later! We all know that the answer is YES. What we do does make a diffEreNce. But knowing this doesn’t seem to make cleaning any more enjoyable does it? House work is like any other essential part of living. Take eating for example. No matter how often do it, we will eventually get hungry. Food is what our body needs to survive. Unfortunately the same goes for keeping up with laundry and a clean house. No matter how often we tidy up, there will always more to do. It’s just another rEsuLt of living. My inspirational conclusion? Well, I don’t really have one. Just remember that cleaning up daily will help avoid a greater amount of misery down the road. I always feel better once everything is back in its place and I can wake up each morning with a fresh start. That in itself is worth it. P.S. I still have a hard time with them even as a grandmother.. I LOVE that. Thanks for sharing, I needed it! You had my “inspirational ending” that I needed. Hey, i agree house cleaning is tough and mentally draining but we all have to do it and keep up with it. The trick that helps me is to clean fifteen minutes each and every day. Just work on one spot of your home. When it comes to the kitchen floor and wood floors if you vacuum or buy a electronic sweeper that weights nothing it will take no time at all. Not cleaning is not an option. keeping dirt, rock, and debris off any floor will make the floor last longer and that means no expense on installing new floors anytime soon. I sell a vacuum that would work great for you. If your interested let me know. I also run a plumbing business so you might like some of my blogs or fun facts i have posted over time. We ship vacuums and the products we sell all over the nation. Also, the vacuum that is an everyday vacuums isn’t listed on my website. Thanks and good luck with all the deep cleaning. “A woman’s work is never done, so why bother?” Right?